Some of my favorite dishes are not very appealing to look at. Some of them are downright ugly. Shepherd’s pie is that way. So is split pea soup. Many dishes with beans and southern cooked greens are less than attractive–one glance at the beans, ribs and greens in my Hillbilly Deluxe Dinner (you pronounce that “deelux,” by the way) shows how powerfully ugly really flavorful food can be. 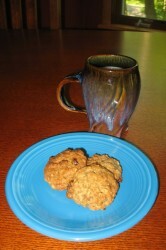 And really, I feel odd putting oatmeal cookies in the same category as some of these dishes. It isn’t like they are that hideous to look at. It is just that they look rather plain and unassuming. Compared to prettified cookies like “Aphrodite Cakes” and “Frostflowers,” though, my oatmeal cookies do look kind of pock-marked and homely. But that is okay with me. What they do not show outwardly, they reveal upon taking a first taste. Unlike the rather hard, unyielding nuggets that they appear to be, they turn out to be chewy, and the brownish color reveals the sun-warmed flavors of honey, golden raisins and almonds, with a hint of tartness provided by the garnet-colored dried cranberries. Spices add further warmth while lemon oil gives a kiss of citrus tang that accentuates the fruits and boosts the ginger and cardamom flavors. And there was a certain flavor I was looking for in these cookies. A distinct fruitiness; I have been craving dried fruits and oats quite strongly, though I have not been wanting to eat oatmeal. Zak had bought me some Pepperidge Farm cranberry oatmeal cookies, and they were quite good, though I refused to buy more of them after I saw that both partially-hydrogenated vegetable oil and high-fructose corn syrup were in the ingredients list. I decided that I would do better eating cookies made from organically grown oats, whole wheat flour, local honey, local butter, local eggs and raw cane sugar. So, that is what I made last night–and I was right. They were better! I wish my ratio of local ingredients was higher, though. Baking is a challenge–I’ve still yet to get that elusive Ohio wheat flour. But, still, they were delightful, and for a cookie, reasonably healthy–it was all of the good parts of warm oatmeal in the morning, without the stickiness! Line cookie sheets with silpats or parchment paper. Mix together flour, salt and baking soda. With an electric mixer, cream butter with raw and granulated sugars and spices until light and fluffy. Add honey, vanilla and lemon oil, and beat until creamy. Add egg and beat until well combined. Gradually add flour mixture to butter mixture, scraping down sides of bowl as necessary. Add oats, raisins, cranberries and almonds, scraping down bowl as necessary. Let cool on sheet for a minute before transferring to a wire rack to complete cooling. Serve with a tall glass of ice cold milk. Thanks for the cookie carepackage you sent with Judi. I actually really love the mug you have in that photo. Where did you get it? I’ve been missing cookies while I’m eating local, but even before I read your post I was thinking of making an exception because I have my writing group coming over next week–can’t bear to think of not baking something for them. But–where are the semi-sweet chocolate chips?!? Glad you liked them, Bry–I was pretty pleased with them my own self. Danielle–we got it in a art and crafts store in Maryland, at Savage Mill. The potter is pretty well famous–I’ve seen his stuff in craft shops all over the country. Unfortunately, I cannot remember his name. Naturally. Lucette–I generally try to make most of my staple purchases local ones. With the exceptions of rice, oats, flour and hard wheat pasta, I can pretty much do this. However, since I try to eat locally as much as possible anyway, I don’t really see the reason to deprive myself of foods during the Eat Local Challenge. I just try to find more local foods than I already consume, and make myself aware of other possibilities. Sterno–sorry, man. I wanted fruity-nutty oatmeal cookies, not chocolatey ones. Zak may have beat me to it, but I found this article on Alternet and thought you might be interested. Benjamin–Zak did not beat you to it this time! I have been meaning to order some of that white whole wheat flour from King Arthur for quite some time. I really want to now, though!